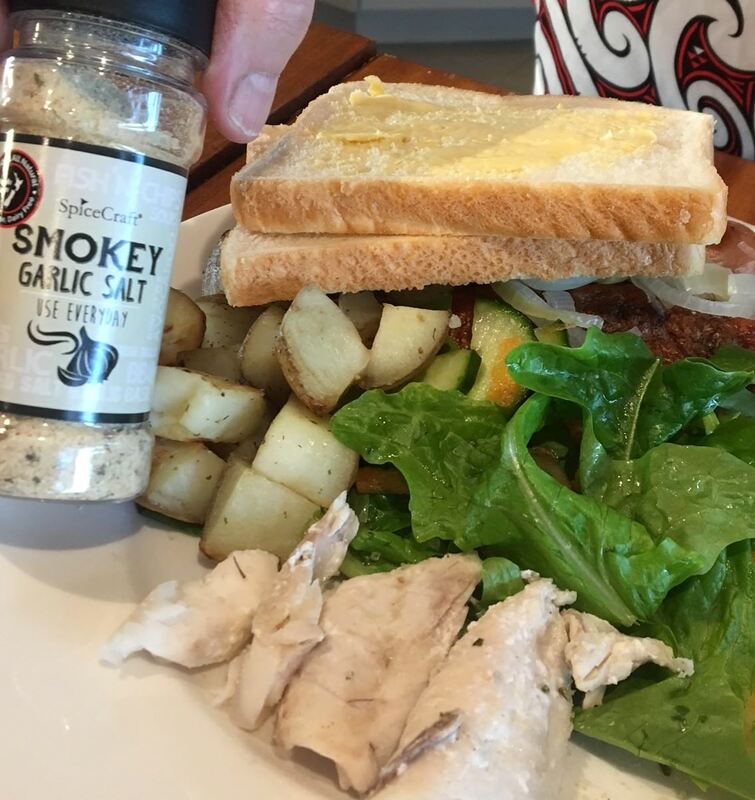 Smokey, garlicky & with a hint of basil - If you like garlic salt you will love our smokey garlic salt! Really versatile. You can sprinkle on meats before cooking - Steak, kababs, etc. 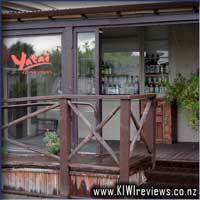 Great in mashed potatoes, stir-fry, pasta, Fish and chips, potato wedges. Or anytime you would normally use garlic salt. 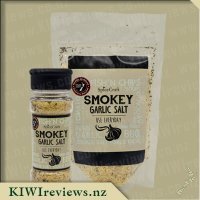 So I love garlic while I&apos;m cooking and love it in most things, I believe garlic helps the immune system and helps me not get sick (of course that&apos;s not medical advise) So when this smokey garlic salt come up from grabs I couldn&apos;t help myself and really want to give it a go. When I got this small neat little container filled with yummy smokey garlic salt the packaging is simple yet its enough to show what it is. What I do like is the little words around the title like fish n chips etc gives ideas on what you can use it for. When family members cook I always find that mash potatoes are bland so I feel something needs to be added I got up from the table and added some smokey garlic salt to my mash and OMG what a difference it made, my potato had a lovely garlic flavour in it now. It really brought it up a level for mash anyway. I added some to my hot chips normally I would just chicken salt but gave it a go with smokey garlic salt and again it was a different party altogether. I love this and would buy it again providing it last a while as the price isn&apos;t my budget friendly. But what you can do with it is amazing. It&apos;s been a while since I have indulged myself in the simple, but unhealthy, pleasures of a fish & chips dinner, but with a few household tasks having piled up on me this week, I decided a junkie dinner would give me a bit of extra time to deal with them and not generate any new dishes to be cleaned. So, off to the shops went I. The chippie I prefer is located right next to the laundrette where I tumble-dry my clothes on wet days, and today was wet indeed, so it was a great place to test this salt. They always seem to load up their food with a mountain of salt and I always have to ask for them to leave it off or risk getting that nasty pucker feeling in my mouth after only a few chips. This time, I took my own! Yes, it felt a bit odd, sitting in the laundrette with the paper spread over the seat, and being watched while I sprinkled this salt on the chips, but the other two people waiting there too were quite intrigued. One had also bought some chips, and asked if he could try a bit after asking me what it was. His reaction matched my own - a loud and enthusiastic YUM and we grinned at each other like we had just shared the best ever joke. Our reaction must have been good, because the lady who was also waiting for her laundry to finish disappeared, and returned a few minutes later with a scoop of chips and shyly asked if she could try some too. This felt like it was turning into a real seasoning party - a feeling that was amplified when she pulled out her phone and fired up some music. Never have I enjoyed doing the laundry so much, and it was all because of this delightful shaker of taste delight. I could easily taste the garlic, but I have to admit I wasn&apos;t sure if I was getting any of the basil. You could say it was almost too subtle, but I&apos;m assuming it was there - there was "something" more to the taste than just salt and garlic but if you bet me a thousand dollars to name it, I would have walked away broke. Still, it&apos;s a really fine garlic salt, and I have tried enough over the years to know good ones from rubbish. This offering is well in the "good" side of the scale. Overall, this is one I am more than happy to recommend to anyone, but I&apos;m now reluctant to offer any more taste-tests. It&apos;s too good, and I want to keep it all for me. While the price makes it seem like a less-than-affordable seasoning, it actually goes a fair way because it&apos;s strong. 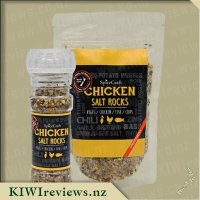 Still, roll on the next food show I see them at, because I plan to get some refills of this and the Chicken Salt Rocks as well. 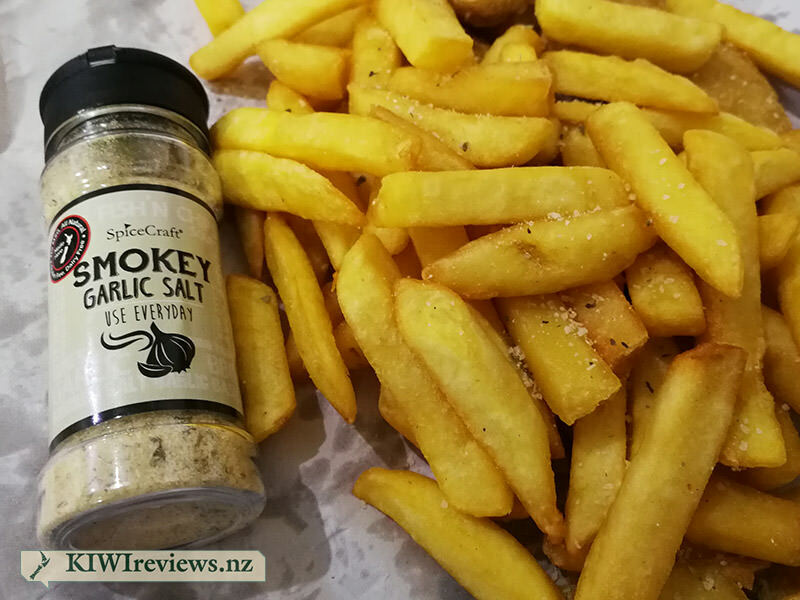 I love all things garlic, so when I saw this Smokey Garlic Salt up for review I was very excited to try it. 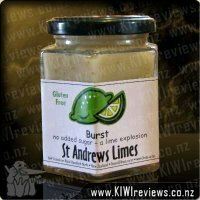 I used to love adding garlic to all of my main meals as it always adds such a great taste, however Miss 5 we have found has an allergy to garlic so we can&apos;t use it in any whole form such as chopped or crushed, so when I saw this I knew that it would be ok for her to have and luckily it was, I was beyond excited as it meant I once again had a way to jazz up my meals with the taste of garlic. The canister of the salt says to use every day, so this is exactly what I did, I used the Smokey Garlic Salt everyday for a week! When I opened the canister for the first time, unfortunately, the top cap snapped off, which now means I have to be very careful when opening and closing it so that I don&apos;t spill it everywhere. However, this was all forgotten when I smelt the most delightful smell of the garlic wafting from the canister it smelt absolutely incredible which I think was largely due to the beautiful smokiness. I must admit that I was surprised by the rather large holes at the top of the canister as these did cause the contents to come out very fast and in rather generous amounts, if I was, to be honest, I would much prefer these to be a lot finer so that I could just get a nice sprinkling of the salt if this was all that was needed in a particular dish. 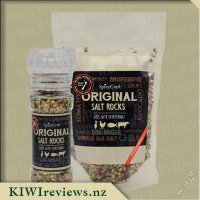 I could tell this product was another one that I really would be able to use in almost everything (just like I had done with the Original Salt Rocks the week before). I decided to try it out first off by making up my own mini garlic bread rolls, I simply softened some butter in the microwave and then added a good tablespoon full of the salt and combined the 2 ingredients together with some finely chopped parsley which I then spread in the middle of some par-baked buffet rolls. The smell coming from the oven as they baked was glorious and when they were removed from the oven it was even stronger. Tastewise the Smokey Garlic Salt worked perfectly in place of normal garlic and to be quite honest I think I preferred them this way better the garlic flavor was more intense and I loved the saltiness with the bread, they were a huge hit all around. Throughout the week I continued to experiment with this yummy salt trying it out over hot chips, adding it to marinades, sprinkling over eggs and roast vegetables, and it was the best addition to some freshly crumbed snapper, there really was no dish that it didn&apos;t go well in, with only half a canister of the Smoked Garlic Salt left I know I&apos;m going to be needing to purchase more very very soon, the best before date suggested on the back of the package says it is best to use the product within 3 months of opening, this surely won&apos;t be a problem I face. If your a garlic fan you&apos;ve gotta try this. Basically if you do not like garlic you better not come to our house as I have the added flavour in pretty much all of my meals. I adore the taste, the smell and knowing that it is good for my family is always a bonus. Whenever I can find an easier way to cook I always jump at the chance so when I saw it was a combination of Smoke with the taste of Garlic and Salt I knew I just had to try. I have to admit I do have a love hate relationship with this product. I adore the taste - that really is not the issue, my issue is the container well more so the lid of the container. I absolutely hated having to take the tag underneath the lid off it just would not budge for me. I pulled every way I could imagine, left, right to the center I just could not pull it off. In the end I had to use a knife to put a hole in it and then I managed to pull the tag off. Now if I had trouble with this tag I can only imagine how difficult it is for the elderly to remove. It really is not that user friendly. My second huge issue with this container is the holes on the lid are massive. I am used to using containers with small gabs and having a tiny bit of the contents come out, but with this, you go to give a sprinkle and a heap of it comes out - usually far too much for the dish I am cooking. 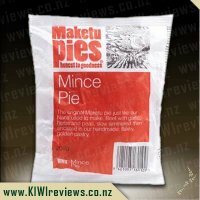 I have used at least half a dozen times now and every single time the same issue has arisen, to the point, I am too scared to cook with it - but as I do enjoy the flavour I have to persevere and try anyway. It is a shame as the consistency of the product is really nice and that smell it really is divine. Besides my issues with the actually container I do enjoy the actual product. I find the flavour has complimented every meal I have served it with. Chips, Steak, Eggs, Potato just adding this transforms the dishes. It does say best to be used within three months and I really don&apos;t think I will have a problem with this as it is such a versatile little product. I only wish it was more user friendly. Garlic and I are best buds, if vampires really did exist I think I have enough garlic in my diet to keep them away for centuries. 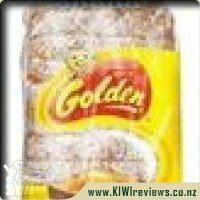 so when this garlic salt came up on offer I couldn&apos;t not put my hand up to trial it and see if it could top all the other brands of garlic salt that I&apos;ve tried, and believe me, I&apos;ve tried a lot. 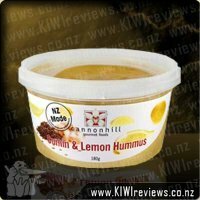 The jar that this comes in is nice and simple, no fancy gimmick here with it and whilst the label doesn&apos;t scream out at you, it does all go well collectively and you end up with a nice looking product. The ingredients list basil and it is easy to spot in the contents, the colour has a nice pale yellow to it. Opening it up and I was so happy to immediately smell nice, smokey garlic. Too often has a salt proclaimed to be garlicky and then robbed me of that beautiful smell that garlic has to off (seriously, a pet peeve of mine is when something says it is garlic flavoured and then you just can&apos;t taste or smell it at all). One thing I don&apos;t like about this product is the size of the holes in the top of the jar, they were so big that it&apos;s not a product I can let my children use on their own for fear of over-salting. In fact, my mother tried this out and ended up with a teaspoon worth of salt on her soup because one doesn&apos;t expect such big holes in a salt shaker. Now, as I&apos;ve said, I adore the smell of this salt and so I couldn&apos;t wait to give it a good go and see just how it would match up to its competitors... 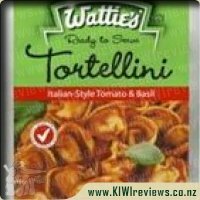 I tried this on my homemade garlic chips, a couple of soups that I made, pasta bake, potato bake and our free range eggs. In all instances I got that lovely hint of smokey garlic, never strong enough to overpower any other flavour but strong enough that it always added a nice addition to all the meals. This has to be one of the best garlic salts that I&apos;ve tried, the only down point to it is the cost, almost double my usual spend, that being said though, I can see me splurging out and buying this in the future. SpiceCraft Smokey Garlie Salt, is another fabulous salt we are now going to add to our collection. We love to use different salts on our meals. Open the lid and get hit with a smokey and garlic hit. Great way to start the cooking process of any meal and know your meal is going to taste wonderful. This salt went with a lot of what we made. Mac & Cheese over the top of the cheese and bread crumbs, also used as a topping for our roast potatoes, which made them so crunchy and a hit with our children. Which means happy mum. Stirfry chicken was soaked in this salt and a little bit of soya sauce, made a tastey stirfry. My mum was here when I used it in a meal and she loved this salt, as she uses normal white table salt. So think I now have her wanting to buy some great new flavoured salts. 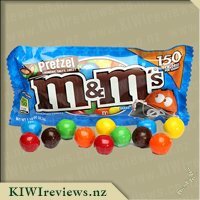 Price for a little packet I am a bit unsure of, it is an wonderful product, I just wouldn&apos;t be able to buy it as often as I would like. Love the cute lettering of the label, made me stop and look at supermarket when I was looking for it. I would recommend this salt as it is great tasting. 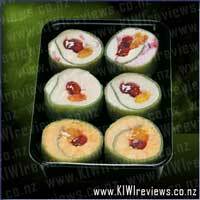 One of the reasons I love being part of KIWIreviews is because of all the amazing food products we get to try. I get stuck in the same old same old very easily, especially because I cook for myself and sometimes for both my partner and I. When there are only two people at the most to cook for, it is hard to find the motivation sometimes. 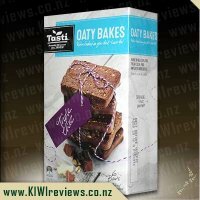 Quick and easy is always the option I go for, and so my challenge to find some products that make it very quick and easy to add amazing flavour to my meals. I love to have simple meals like chicken and salad, but it can get very bland. When I saw the SpiceCraft products up for review I had to put in a request for a few of them. 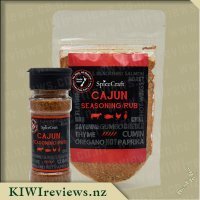 When my parcel arrived I noticed that this smokey garlic salt was in the box, along with the cajun rub. 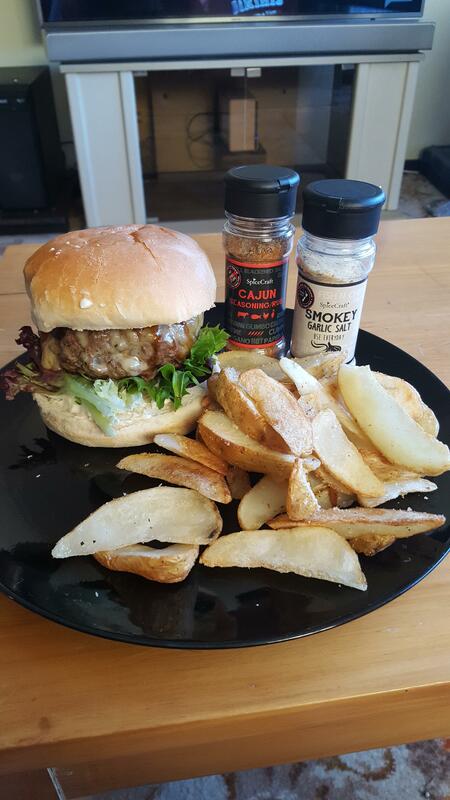 My partner and I put our heads together to decide what to use them for, and we settled on burgers with the cajun accompanied by wedges with teh smokey garlic salt. Preparing the wedges to cook I opened up the smokey garlic salt jar and took a little sniff. I was met with the most amazing garlic smell, and something else I couldn&apos;t quite put my finger on. It wasn&apos;t until I read over this product listing before writing this review that I realised it is the basil! I had read the ingredients list on the jar but it simply said herbs and spices so wasn&apos;t sure what it was, but I have since realised that the ingredients are written on the label on the front of the jar just under the smokey garlic salt heading. Now I know to read this part of the label to see what is included in the SpiceCraft products. Just as the wedges finished cooking we sprinkled some of the garlic salt on and put them back in to keep them warm while we assembled the burgers. The heat from the oven brought out the smokey garlic smell even more and the entire house (it is only a small flat!) smelt amazing. I couldn&apos;t wait to try! We served the wedges up and I couldn&apos;t wait - I had to try one before I even had the chance to take the photo! The flavour was as amazing as the smell, it was a great mix of garlic salt with a smokey taste to it too - two of the best flavours combined together, along with a salty flavour (obvious with it being a garlic salt). This product will definitely be a regular in the pantry from now on. I look forward to finding other ways to try it. This was the second in this range that I tried, and I was not disappointed. There was a strong garlic aroma as soon as the pack was opened, and both my daughter and I shook a little on to our hands so we could taste it! For people who do not like garlic this might be off-putting, but we are both firm fans so were happy to find that the taste was just as strong as the smell had indicated! We were planning a meal with another family - altogether five adults and five children. Luckily, the children are all firm fans of garlic so there were no concerns about treading lightly where they were concerned. It was to be a simple meal: barbecued fresh fish, chicken wings, cubed potatoes, a green salad, and lots of bread and butter! We sprinkled the salt over the fish, chicken wings, and potatoes and gave them to my son-in-law who was the chief cook. When the meal was served, we put the salt container on the table so people could help themselves to extra if they needed it. The adults all added more after tasting their food - it was not quite strong enough for them - but only the oldest child (aged 11) added any, and that was to his potatoes. It was good that we all enjoy garlic because the air was fast becoming laden with the aromas of barbecued meat and spices. Everyone loved the flavours and there was very little left at the end - just a couple of crusts of bread and a pile of discarded chicken bones. My son-in-law said he would eat this in preference to plain salt any day, and could not wait to try it on hot chips. He also said it was a good thing that chips are an occasional treat as he would probably eat them every day with this salt if he could, and that might not be good for him! 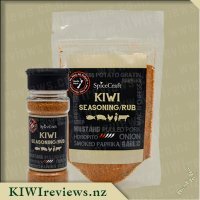 He did comment that, unlike some of the other rubs and seasonings in the range, this one would not adapt to sweet dishes. However, I disagree; I can see it going well with some of the sweet/sour oriental meat dishes that I make from time to time. I tried the salt on my own a few days later. I had a couple of stale bread rolls so turned them into garlic bread to freshen them up. I mixed the salt with unsalted butter as I did not want to overdo it and then spread it liberally inside the rolls, brushing them with milk before wrapping them in foil and reheating. I am so glad I had only two left! Had there been more I would have been tempted to continue eating till they were all gone. I normally use the fresh herb in garlic bread (with the more common salted butter) but this version was just as good. And it saved a lot of chopping! I can see a place for this on every kitchen shelf - from the point of view of a busy person who enjoys entertaining, it is useful to be able to make a gourmet dish quickly, and garlic is the base of so many recipes. It would also be good for cooks who do not like the smell of garlic to be able to prepare meals for other people without the lingering smell and fiddly peeling and chopping involved when using the fresh product. I think, of all in the range, this may well prove to be my favourite.